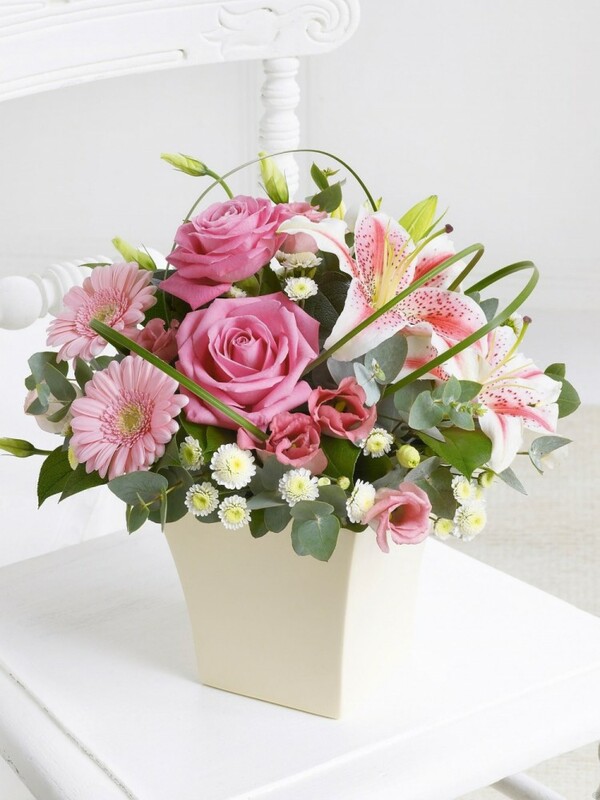 It is the timeless beauty and elegant simplicity of this arrangement that makes it special. Exquisite large-headed roses, graceful lilies and a beautiful selection of germinis, lisianthus and spray chrysanthemums make up this chic display, and the looped steel grass adds a contemporary twist. Coming with a box of chocolates, this is a lovely gift. Featuring 2 pink large-headed roses, 2 pink germinis, 1 pink Oriental lily, white spray chrysanthemum and pink lisianthus with steel grass, Eucalyptus Cinerea and pittosporum carefully arranged in a cream ceramic container.